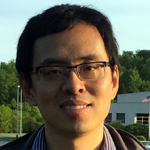 Chen Li, Neutron Scattering Coordinator for the past two years, has acepted a position as Assistant Professor in the Department of Mechanical Engineering at the University of California - Riverside. He will continue his involvement with EFree as an Affiliated Scientist. We thank Chen for his many contributions to the Center as one of our Technical Coordinators, and we look forward to continued collaborations.